Battleground 2017 takes place on Saturday November 25th, at the Queen's Campus Sports Hall in Stockton-on-Tees, TS17 6BH, running from 10am until 3pm. Our big news is that this is our 5th year running the event, so we're offering FREE ENTRY for everyone! The living history groups have always been a popular attraction and this year we're hoping to have the Durham Pals, Lonestar and Vanguard all returning for 2017. Don't forget to tell your friends about the FREE ENTRY and we hope to see you there! 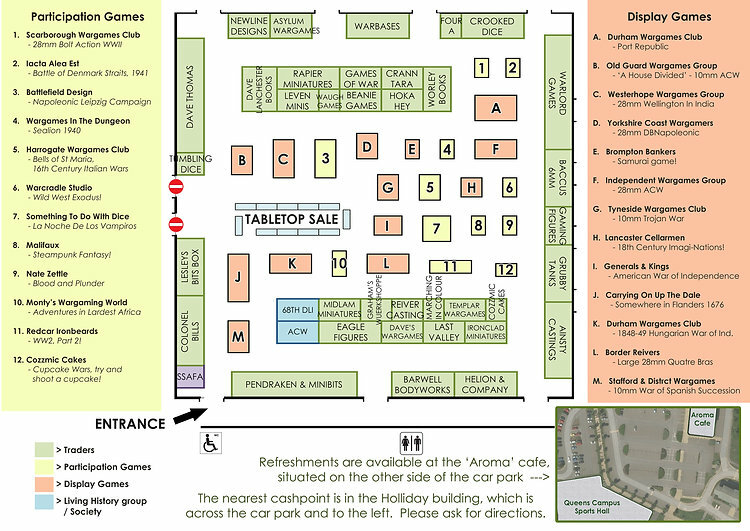 With the Not-Derby show out of the way, we've just about confirmed all of the traders for this year's show! Barwell Bodyworks - Bringing their ranges of airbrushes and paints. 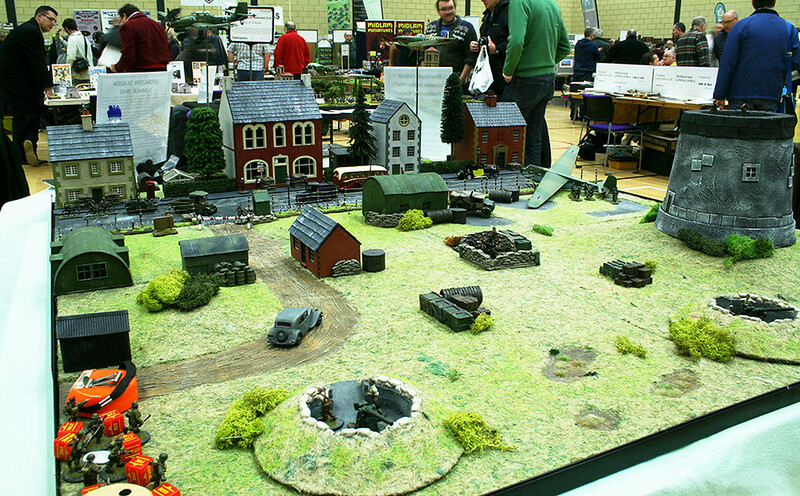 Dave's Wargames - Dave had attended the show previously on the tabletop sale, so this year he's got a proper stand! Helion & Company - A book publisher with an excellent selection of titles. Marching in Colour - Excellent painting service covering a variety of scales. Newline Designs - Various ranges in 10mm, 20mm and 28mm scales. 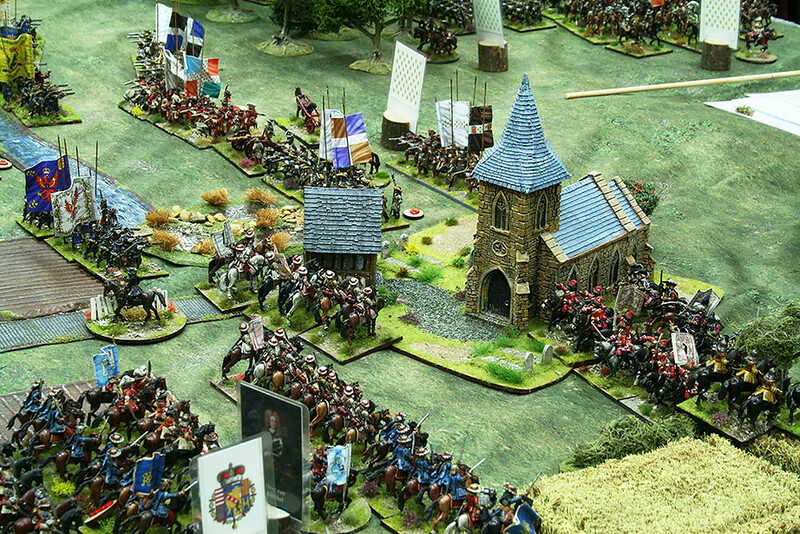 Rapier Miniatures - Excellent 6mm ranges and also some 28mm figures as well. 3	Barwell Bodyworks http://www.barwellbodyworks-shop.com - NEW FOR 2017! 12	Dave's Wargames	https://www.facebook.com/Daveswargames/ - NEW FOR 2017! 19	Helion & Company	http://www.helion.co.uk/ - NEW FOR 2017! 25	Marching in Colour http://marchingincolour.blogspot.co.uk/ - NEW FOR 2017! 28	Newline Designs http://newlinedesigns.co.uk/ - NEW FOR 2017! 30	Rapier Miniatures http://www.rapierminiatures.co.uk/ - NEW FOR 2017! And don't forget, it's free entry this year! God I would love to be there but will have to be next year. paintinglittlesods wrote: God I would love to be there but will have to be next year. Ditto. I'd be forced to take a bulging wallet for that wonderful list of traders. Is that, The Show Formerly Known As Derby? A bit like Fiasco being held at The Venue Formerly Known As Saville's. On the subject of TSFKA Derby, given that the Ilkley Lads have decided that the new venue is too far to go to put on a demo next year, will there be room at the inn (Battleground) for us next year? We now have a gap in our calendar. Worth an ask, I suppose. Who should we contact? olicana wrote: Is that, The Show Formerly Known As Derby? I think we can certainly find you guys a spot, no worries at all! Drop me an email through either the Pendraken or Battleground sites and I'll get you onto the list to contact for 2018. Or grab me at a show somewhere, we'll be at Fiasco in the Saville's, sorry, New Dock Hall in a couple of weeks! I'll catch up with you at Fiasco. We're doing Zorndorf 1759, and we're on the same aisle as your stand, in the VFKAS. olicana wrote: I'll catch up with you at Fiasco. We're doing Zorndorf 1759, and we're on the same aisle as your stand, in the VFKAS. No worries, we'll catch you there then. We've got 13 participation games for you to take part in! 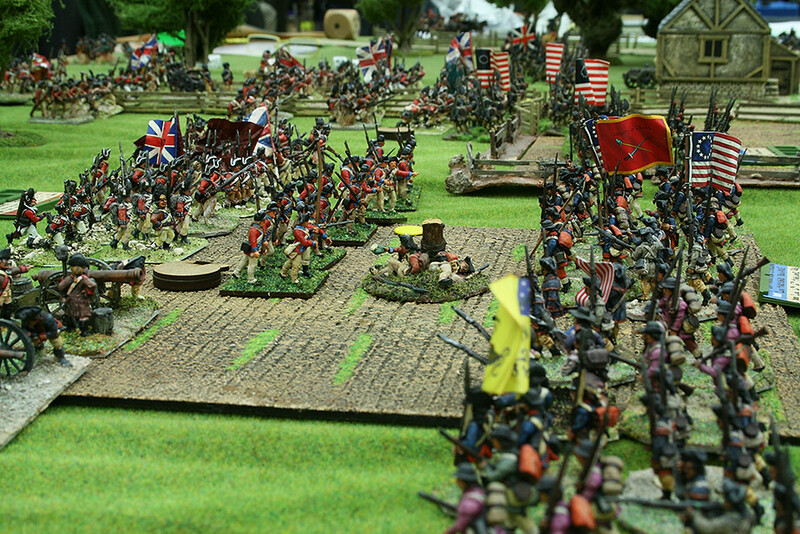 > Imperial Ambition - Napoleonic battle set during the Leipzig campaign. Visitors are welcome to participate! > Details to be confirmed. > Cake Wars returns, have a go and see if you can win yourself a cake! 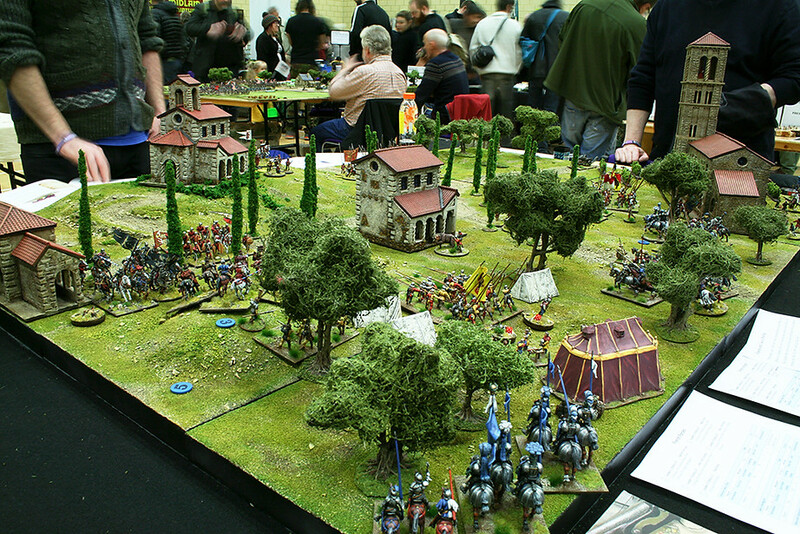 > The Bells of St Maria - Sharp Practice game set during the early 16th Century Italian Wars. Can the Italians get to the Abbey of St Maria and ring the bells to alert their main army to the location of the French and Swiss, and at the same time recover the experimental Leonardo tank captured by the Swiss. > 'Load, Load, Load!' - The Battle of the Denmark Straits, 1941. > Steampunk Fantasy skirmish game set in an alternative world of magic, zombies and corruption. 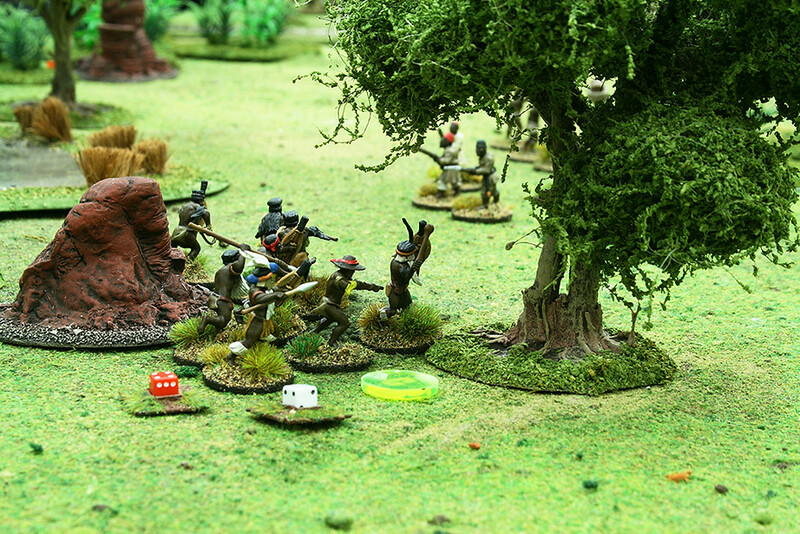 > Adventures in Lardest Africa - TooFatLardies' Sharp Practice 2 variant for Darkest Africa. > Blood and Plunder - A 28mm miniatures wargame set in the New World during the 17th century. Featuring an innovative initiative system and simple and inituitive ruleset. Brandish your cutlass and musket and prepare for high adventure on the Spanish Main. > WW2, Pt 2 - 100 days after the end of the war in Europe, Stalin had promised to attack Japan. Instead he changed his mind and decided to attack his former allies. > Something To Do With Dice 2: La Noche De Los Vampiros - Inspired by From Dusk Til Dawn 3 and featuring a new town. Rules will either be Dracula's America or Curse of Dead Man's Hand. > Wild West Exodus - A dynamic, fast-paced semi-skirmish game pitting a cast of brutal characters against each other in a world very much like our own, but twisted by the forces of deepest evil. Characters are balanced upon the edge of a knife, a horrible death waiting patiently on either side. 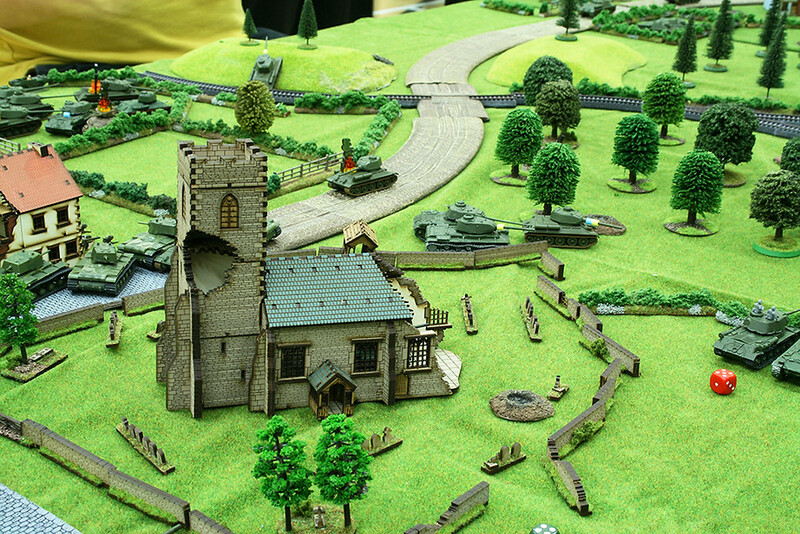 > Sealion 1940 - A fast play game using Bolt Action rules. We've got 13 display games on show! 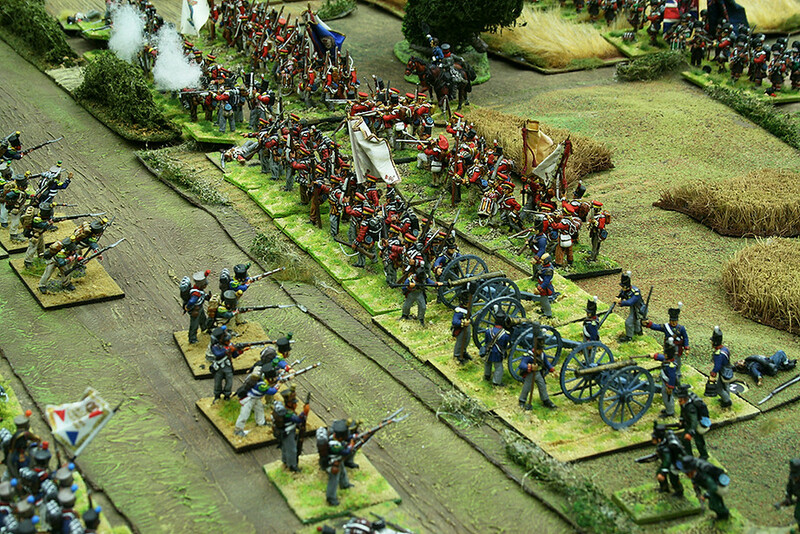 > Large 28mm game showing Quatre Bras! > Samurai - Details to be confirmed. > Somewhere in Flanders 1676 - An action set during the French-Dutch War of 1672-78. > 1848-49 Hungarian War of Independence - 42mm game complete with a railway! 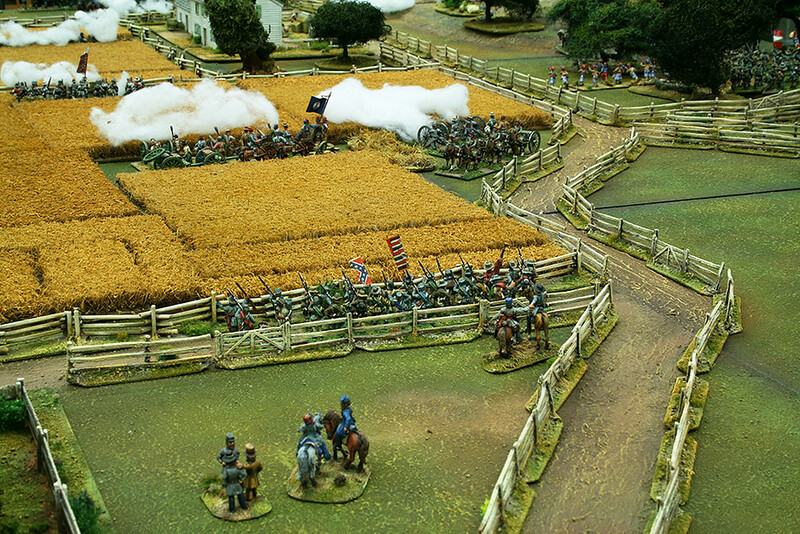 > Port Republic - Stonewall Jackson Valley campaign refight from 1862 in 28mm. 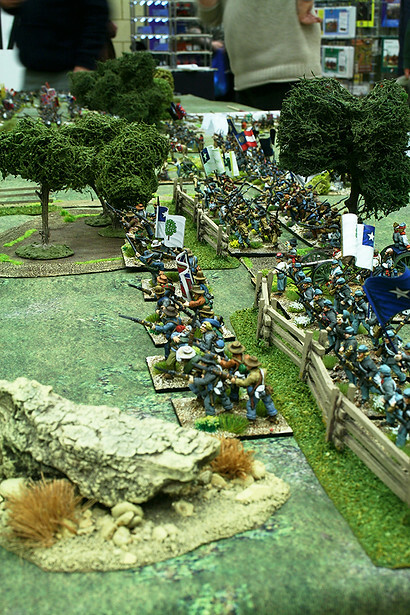 > 28mm ACW game using the new Pickett's Charge rules. 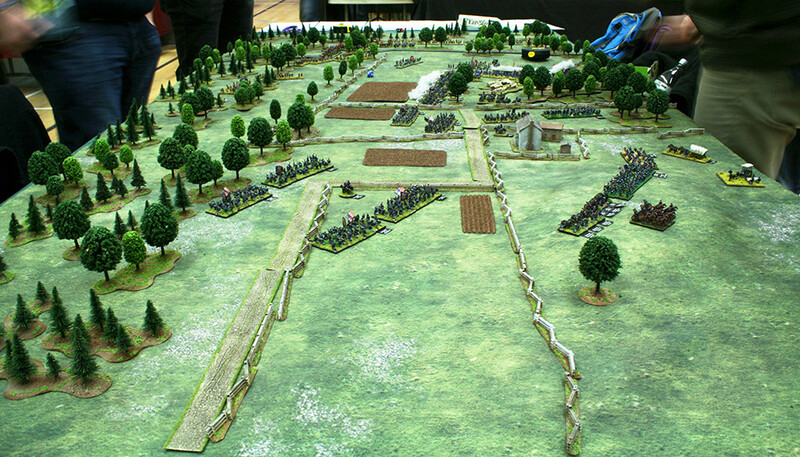 > An 18th Century imaginations siege game using Spencer Smith 30mm figures. 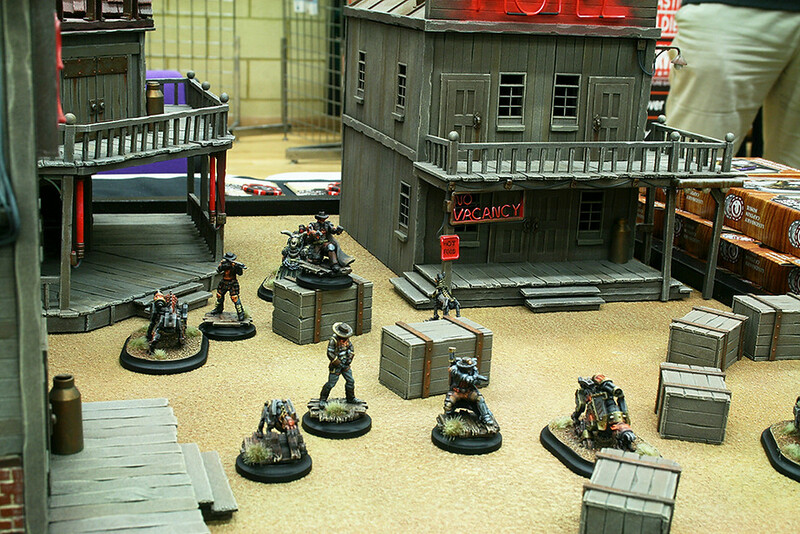 > 'A House Divided' - 10mm ACW game! > 28mm Wellington in India! 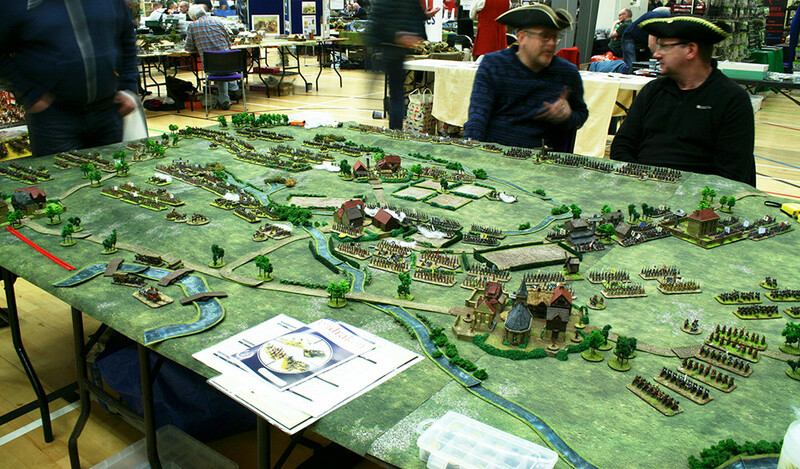 > A 28mm DBNapoleonic game! And once again, it's free entry this year! Forgive me if I am missing something, but I think Zorndorf was fought on August 25, 1758! Or is this an imaginations battle? The original Battle of Zorndorf is one of may favourite engagements in the 7YW! You will have to post pictures of your game! Bookings for the Tabletop Sale are now open! For only £1 per half hour slot, you can sell as much as you like, with no commission at all! You can deal directly with the buyers, answer any questions they may have, and also keep an eye on your goods. Once your time is up (or better still, you’ve sold everything! ), you can walk away, cash in hand, and enjoy the rest of the show! The Tabletop Sale will be open for bookings from 9:30am on the day, giving you time to get set up before the doors open. The entry wristbands have arrived today, not long to go now! We're only 10 days away from Battleground 2017 now, so for anyone unsure of where the venue is, here's the directions! If there are any queries at all on getting there, just get in touch and we'll point you in the right direction! With little over a week to go, here's the layout for the day so you can plan your purchases and decide which games you'd like to play! Today was a great show! Thanks Leon! After a day to recharge, we've put together our show report on this year's event, so head over and have a look! http://www.pendrakenforum.co.uk/index.p ... 853.0.html We've already got some ideas for next year's event so it would be great to hear any feedback from the visitors. Independent Wargames Group blog: https://independentwargamesgroup.blogsp ... -2017.html?